Reclaiming screen mesh is a tedious, time-consuming process. Without the correct products to suit your particular mesh, emulsion, ink, etc., it can be even more problematic. UV Process Supply offers the right reclamation supplies for your UV print production to save you time and money in screen preparation and reclamation expense. AEROSOL ANTI-STATIC SPRAY is an invisible light spray treatment that counteracts static electricity charges. Spray on metal rollers, feed boards, feed arms, cylinders, tapers, rollers, drive belts or any place where static may generate. Non-staining, clear, quick-drying film helps reduce dust attraction as well. Non-flammable when dry. 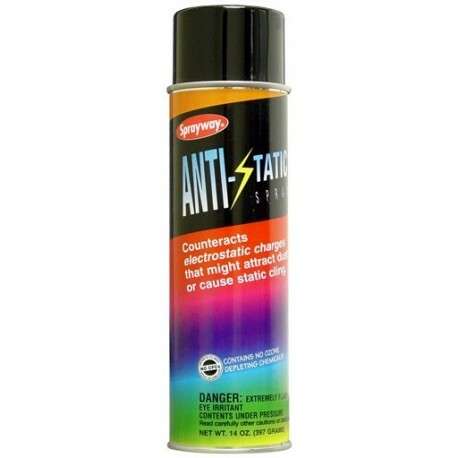 20 oz aerosol can - 12/case.